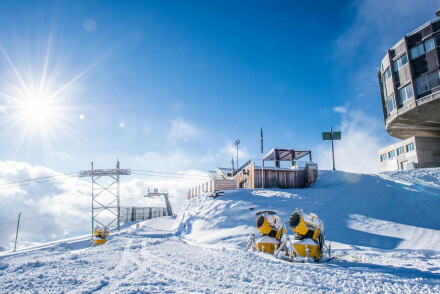 Laax is part of the ski area called the Weisse Arena, a high altitude region known for being snow-sure, with a lively après-ski and having excellent conditions for snowboarders looking for big air. 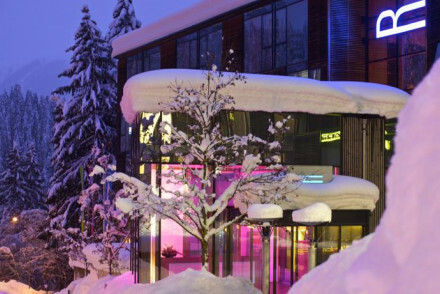 The nearby resort towns of Flims and Falera are the other places to stay to enjoy the Weisse Arena, but if you’re looking for contemporary cool then Laax is probably for you. A couple of years ago all of our Guru’s recommendations for the best places to stay in Laax would have been fairly traditional alpine hotels - great options with lots of lovely detail, now found largely in Laax Dorf, the original village. But in the last few years several new hotels have been built, much closer to the lift base, with a much more modern, high-design-y feel. So now there’s more choice for you if your idea of the best places to stay in Laax run more towards the modern. However, if you’re looking for charm then Laax Dorf is for you, it’s set on a pretty lake and feels pleasantly rustic. In summer Laax, with its impressive mountain views, and open meadows surrounding the town, is a very popular spot for well-heeled Swiss and German families. The lakes here are glacial, but that doesn’t stop people swimming and going boating or out in pedalos! Laax is also an amazing place for hikers and climbers. In winter Laax is a good option if you’re looking for a Swiss resort with good snow and lively après-ski - it’s especially lively during January when it hosts the European Snowboarding Open. But don't forget that the best places to stay in Laax will be extremely busy too. So if you want to be sure of a room, book well ahead. The Aussichtsplattform Il Spir Conn, located a few miles away in Flims, offers a wonderful view of the surrounding area - be sure to remember your camera! If you're visiting in the summer then head out on the large Caumasee lake and explore the area's natural beauty. For those with a head for heights there's plenty of climbing opportunities. Hike or mountain bike along picturesque trails and find routes to suit all abilities. Enjoy adrenaline fuelled days exploring the world-class ski pistes. 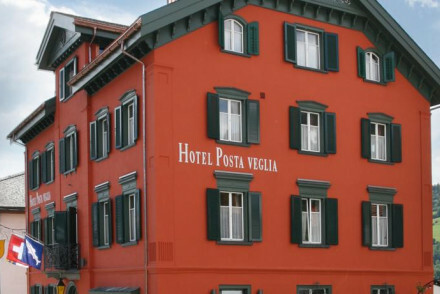 The Posta Veglia is a charming, alpine-chic hotel with all the traditional details alongside all the modern comforts. There are just seven rooms with romantically sloped rooms, exposed beams and cosy details. There’s also a Swiss restaurant onsite. There are incredible mountain views from the junior suites, which also have deep bathtubs. The Hotel Bellaval is just minutes from Lag Grond lake and has traditional alpine rooms overlooking the lake and mountains beyond. There’s a very nice sauna and wellness spa and a pretty garden serving the rooms. If you want to be by the lifts then Riders Palace is for you. It’s got stunning views from its expansive glass walls and comfortable, uber-modern rooms. There’s also a lively bar and you’re walking distance from Laax’s restaurants. The Hotel Signina is another good option. Rooms are light and airy, there's a great wellness centre for easing weary limbs and a lively bar for some well earned apres action! Mountain Hostel Crap Sogn Gion is the ideal spot for serious skiers, being located right on the slopes at an altitude of 2228 metres. The rooms, however, are slightly basic - though their restaurant more than makes up for it. Waldhaus, Flims is a truly stunning spot. Having recently received a large investment restoring it to its former glory, it boasts plush rooms, all the mod cons, no less than four restaurants and beautiful views. Hotel Schweizerhof, Flims is a gorgeous Belle Époque property with uber-stylish accommodation, a top-notch restaurant, spa and indoor pool. Indulgent. Hotel Adula is another lovely retreat. The rooms are Alpine-chic in style, with plenty of wooden furnishings, whilst there are extensive spa facilities in which to unwind after a long day skiing. The two restaurants serve up typically Swiss cuisine. Hotel Cresta offers a range of individually-styled accommodation with pine walls and modern bathrooms. Tuck into regional cuisine before enjoying an evening tipple on their spacious terrace. Hotel Chesa is a comfortable stay boasting gorgeous views of the surrounding area and easy access to the slopes. With typically Alpine rooms and a cosy restaurant serving up regional dishes, it's a decent all-round spot. Fidazerhof is perfect for those looking to have a rejuvenating trip. This Ayurvedic wellness hotel, set right on the slopes, offers stylish contemporary rooms, a lovely restaurant, a terrace boasting breathtaking views and a spoiling wine cellar. Six-room Casa Alva is a charming stay with pine-clad accommodation and private terraces. Come back after a long day skiing to enjoy wonderful meals from their gourmet restaurant. Fly into Zurich Airport before taking a train over to Laax - this should take about two hours. If you're coming to ski then you'll want to visit between December and March, but if you want to hike then consider coming in the summer months. The weather's at its nicest in July, when the average temperature rises to 20°C. If you want to see more of the surrounding area then consider hiring a car with Rentalcars. Browse through our list of all the best places to stay in Laax. 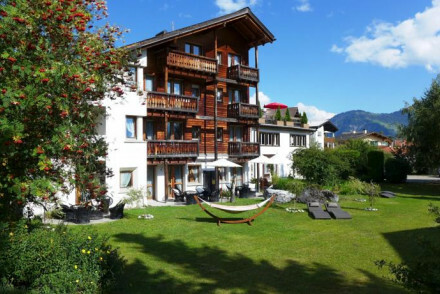 Expand your search to include the best places to stay in Flims. Perched on the slopes overlooking the town of Laax, Mountain Hostel Crap Sogn Gion is ideal for serious skiers. Sitting at an altitude of 2228 metres, the hotel offers a super restaurant and simple, functional rooms that are great for groups and families (some sleep up to four). Winter season only. Great walks - The surrounding valley is home to a whole host of great walking routes. A hip contemporary hotel ideally located just steps from a cable lift. Expansive glass walls offer stunning views. Comfortable rooms with uber modern bathrooms and sink-in-to beds. A lively bar for those who wish to après–ski. Walking distance from Laax's restaurants. Modern alpine bliss. Active Holiday - Situated right by the cable lift this hotel is an ideal base for hitting the slopes. Skiing - Laax is one of Switzerland's most expansive ski resorts. 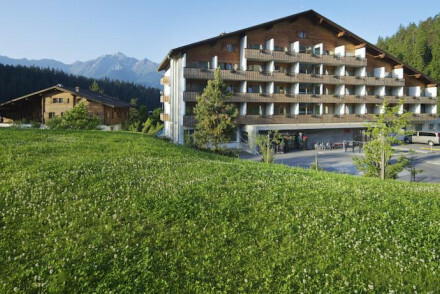 A charming hotel minutes from Lag Grond lake in Laax. The traditional Alpine rooms offer fantastic views and a cosy, homely atmosphere. It's perfect for a bit of countryside exploring, with many local hiking options up the Grisons mountains. Enjoy the sauna in winter and the lovely garden in summer. Country Escape - A tranquil country setting, next to the Lag Grond lake, with views of the surrounding mountains. Total relaxation - Take a walk around the peaceful Grisons mountains or simply relax in the sauna and wellness spa. Active Holiday - With plenty of local skiing, hiking, cycling and there's also a golf course nearby. Birdwatching - This area holds a wide variety of birdlife, don't forget your binoculars. A contemporary hotel boasting easy access to the slopes. Cleanly designed, light and airy rooms still manage to keep a homely feel. A spoiling wellness centre will ease any aches and pains and a lively bar provides the perfect atmosphere for some apres ski.The ideal mountain retreat. Skiing - Located right at the base of the ski resort of LAAX with unique access to 235 km of slopes. Active Holiday - Irrelevant of the season there's always plenty of adventure activities on offer. A charming rustic-chic hotel with traditional Alpine décor and contemporary comforts. Sloping roofs, exposed wooden beams and cosy interiors along with bath tubs in bathrooms and central heating. The restaurant on site serves traditional Swiss cuisine. A cosy mountain hideaway. Romantic Break - The junior suites are large and spacious and come with great views of the surrounding mountains, as well as deep soaking tubs. Active Holiday - A haven for skiers, hikers, bikers, climbers and fishermen- the ideal outdoor holiday destination. Great walks - Beautiful hikes into the mountains. Book a guided tour or go on your own. Fishing - Make a day trip to Lake Cauma for fishing opportunities.